The Edmark Reading Program Functional Words Series–Second Edition teaches 400 functional sight words to students who have a variety of learning differences. Students with autism spectrum disorder, developmental delay, intellectual disability, hearing impairment, reading disability, or learning disability, as well as learners of English as a second language will benefit. 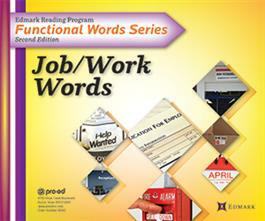 The Functional Words Series can be implemented as part of a functional living and community skills program or as a supplement to other reading programs. The Functional Words Series uses a word recognition method, involving repeated exposure to target words within a variety of engaging learning activities. Students learn 100 new words at a moderate pace in each of four functional areas: Fast food/Restaurant Words, Grocery Words, Job/Word Words, and Signs Around You. The second edition includes new stories, games, word cards, and photo cards. Teacher’s GuideThis detailed program guide addresses the research supporting the program and fully describes the program components and how to implement them. The Teacher’s Guide also includes answer keys for the Stories Activities and the Reading and Social Skills Games lesson plans. Lesson Plan/RecordThis reproducible guide for lesson planning also provides for continuous progress monitoring for the individual student. The Lesson Plan/Record is useful in adjusting the pace of instruction to meet the needs of individual students. Word RecognitionTwo spiral-bound books contain the target words in order of presentation. Target words are first introduced within the Word Recognition activity. PosttestsThe Posttests measure retention of each group of 10 words and are included in the Word Recognition books. Vocabulary ExercisesVocabulary Exercises reinforce recognition and understanding of the meaning of the target words through matching words to illustrations. These 300 reproducible activities are presented in a variety of formats. Stories and Stories ActivitiesFive storybooks containing 50 stories allow students to practice using the newly learned target words while listening to, reading, and discussing the stories. Character Illustrations aid in comprehension. Stories Activities provide pre-reading and post-reading exercises to strengthen comprehension at the sentence, paragraph, and story level. Reading and Social Skills GamesGames reinforce the functional vocabulary and promote generalization by requiring students to use reading skills in a social setting. Students also develop social skills and a basic understanding of various game playing procedures. The Games include a full color game board, playing pieces, and dice. Photo Cards100 full color photo cards reinforce vocabulary, comprehension, and extend students’ understanding of the newly learned words. Word Cards Word List 100 word cards are included in each kit. The lesson numbers are in the upper right corner. The Lesson Plan/Record is revised and expanded to provide simplified continuous progress monitoring combined with an easy-to-use lesson planning format. Posttests are included following every 10 words taught in the Word Recognition books. Photo Cards, featuring 100 four-color photographs with target words printed beneath the images, are included in each kit and can be used to introduce students to each new word. The photos reinforce the target words in a realistic way and aid in vocabulary development. Word Cards, feature 100 words taught in the program in a handy playing card format. A CD-ROM contains the reproducible Lesson Plan/Record, Vocabulary Exercises, Stories Activities, Character Illustrations, and files to use with the games (see Appendix D).